While inventory levels are low and it is difficult to find a suitable home, buyers should not loose faith as delaying the purchase will cost them. Below you will see the assumption of a 700K purchase at current rates of 4.75% resulting in a monthly mortgage cost of $2,921. 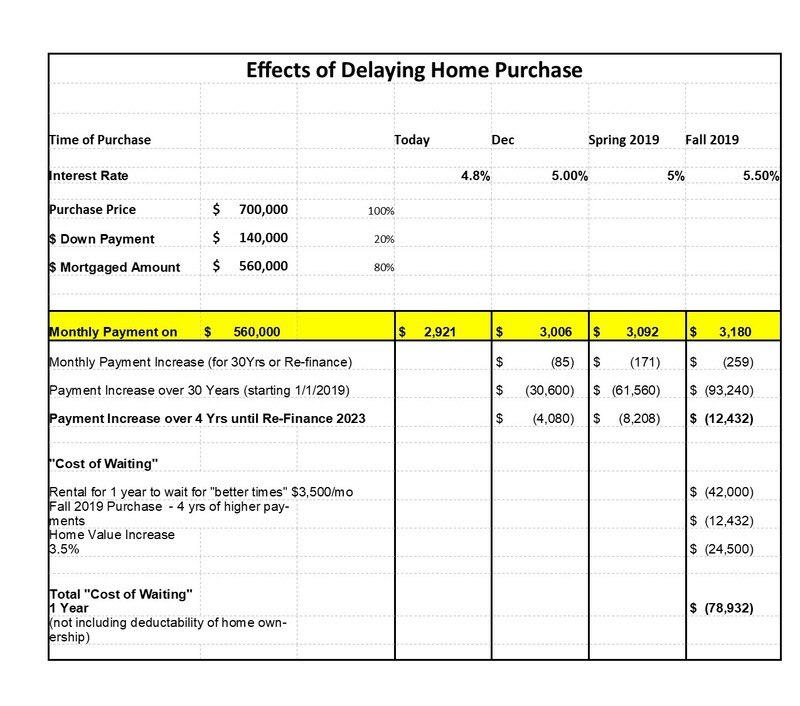 Delaying the purchase by one year means that the same $560,000 of loan amount will cost at 5.5% $3,180 per months or $259/mo more. Assuming an slight economic correction in the not so distant future, resulting in a modest drop in home prices in 2021 and the consequent lower interest rates to boost the economy starting 2022, a home owner would have lost $259/mo and over 4 years a total of $12,432. We further assume a monthly rental cost of $3,500/mo until the purchase in 2019. Home values are still going to increase overall by 3.5% and more in the “hot price ranges of 500-850K” due to lack of inventory and a strong economy. Result: A 700K home purchase in one year will cost a buyer $78,932 more next year – or 10%, not taking tax advantages of home ownership into consideration. If that home buyer has a 30Yr fixed mortgage, the additional cost to wait for a year would be $93,240+$42,000+$24,500= $159,740. It does not make any financial sense to deliberately delay the purchase of a home right now! Please call, email or text me at 201-310-1260 or tHorkenbach@gmail.com to take a look at your personal scenario.